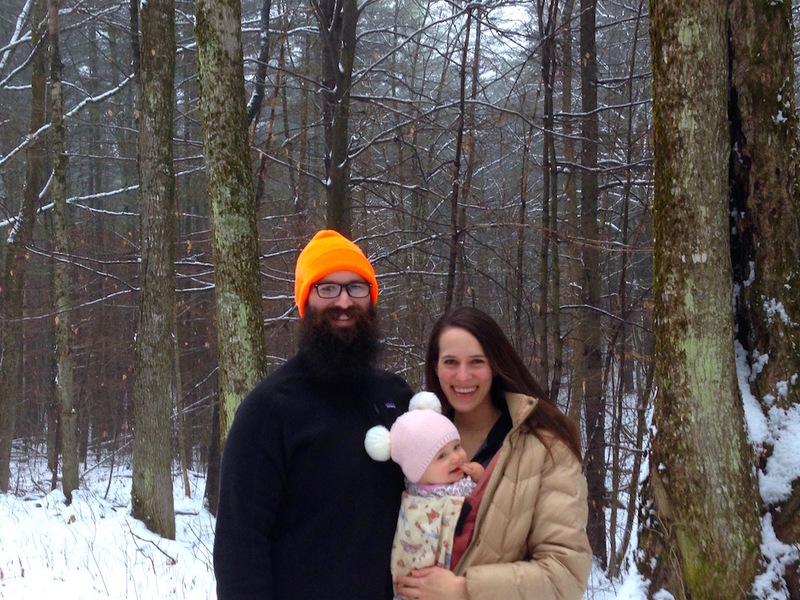 When people ask why we moved to Vermont, I always answer “the woods!” And it’s true, we love our woods. We love looking at them, thinking about them, discussing them, photographing them and, most of all, being in them. However, as you might’ve noticed from my recent photos on Facebook and Instagram, we are currently in the depths of a typical Vermont winter–in other words, we won’t see our grass again until sometime in late spring/summer (TBD) on account of the prodigious snow cover . But that hasn’t stopped us from frolicking in our woods. For wintertime sports, it’s all about the gear and the mindset. And I use “sports” very loosely because I am not a “sport” person–anyone who has ever had the misfortune of playing on a team with me will attest–I’m terrible at actual sports. But pursuits? Activities? Frolics? I like those. I used to have a serious aversion to going outside in the winter for any extended period of time. I don’t like being cold and I didn’t see how it could possibly be fun to intentionally subject oneself to sub-zero temperatures. My toes would be froze, my nose would be froze… oh how little I knew then. Ultimately, however, my desire for frugality won out. There’s no cheaper way to exercise, entertain oneself, and enjoy life than to get outside and revel in whatever weather happens to be happening. When I first moved to the Northeast ten years ago, I thought I might freeze to death… inside my apartment. And look at me now–I chose to move even farther north in order to enjoy an even colder and even longer winter. Mr. FW is moot for this argument because he has always adored the cold (weirdo)–no cajoling needed. Lo those ten years ago, as I shivered and shook, Mr. FW sat me down to have “the gear talk.” The gear talk is difficult for people like me who previously cared greatly about my appearance at all times–blizzard or no. But my long-suffering patient husband kindly steered me towards understanding that some things (aka fashion) must be sacrificed in order to fully appreciate outdoor winter pursuits. It seemed superficial to me (newsflash: it was) to avoid winter hiking because I didn’t want to look unfashionable, so I bucked up and got on board the cold weather gear train. It is decidedly not fun to be cold while pursuing outdoor activities and wearing inappropriate gear will quash your fervor in a hot minute. Long underwear: start yourself out right with a non-cotton base layer. This’ll insulate you to the core. Any non-cotton (silk, spandex, etc) shirt and pants will do. No need to get fancy-fance. Hat: Mr. FW and I both have a windproof hat (pictured at right), which works wonders. It comes down low across the forehead and ears and is impervious to even the most frosty of winter gusts. I’ve worn this on many a mountaintop and always been quite cozy. Hand coverings: I like my windproof mittens with a waterproof shell and a layer of thinsulate, while Mr. FW prefers these gloves with glove liners. Facemask: The ultimate capitulation to form over function, I ADORE my facemask. Not an exaggeration. It keeps my nose, cheeks and chin from becoming wind-chapped. Mr. FW calls it my “bank robber chic” look and I’m OK with that. I think I look pretty badass myself. Coat: Down-filled is the way to go. I found my Land’s End down-filled coat in a trash pile by the side of the road several years ago. I washed it with down wash (to preserve its waterproofed-ness) and, three winters later, it’s still keeping me roasty toasty. It’s a size too big for me, but that turned out to be ideal during my pregnancy last year–it zipped over my pregnant belly and later, over Babywoods in a carrier. I like that this coat comes down to just above my knees–added warmth, but not so long that it restricts movement. Floor-length coats are lovely, but impossible to hike in. While wool coats are warm, they’re not waterproof and you’ll end up a soggy mess (plus you’ll smell like wet sheep… ask me how I know this). Snowpants: Mr. FW has full suspender snowpants (because he’s just that cool) and I have pant snowpants (not sure what the technical term is there) and both work well. Much like the coat, the goal here is waterproofed-ness. With snowpants on, you won’t be distressed by precipitation or the occasional roll in the snow. You Bought This Stuff, Mrs. 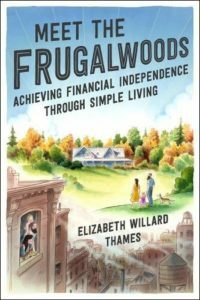 Frugalwoods?!? Hounds need warm gear too! Alas ’tis true, we bought all of this gear in the past (and received some of it as Christmas gifts years ago from our families), but the key is that we only had to purchase each item once. That’s the beauty of well-made, appropriate winter gear: you don’t replace it every year or even every ten years. It keeps on trucking. Sure, it’ll wear out at some point, but these things are long-lasting. It’s also true that you don’t need 6 different hats–you just need one good hat (same goes for everything else on the list: one will suffice). For care and maintenance, I wash all of our stuff in the washing machine a few times every season and then hang it to dry. Plus, not buying gear because you don’t want to spend the money and then not enjoying the outdoors because you’re too cold is not a wise application of frugality. It’s also what I did my first year in the Northeast. I was so resistant to forking over the cash to outfit myself properly that I trudged around in a thin wool coat and plastic rain boots and nearly got frostbite on my left toe (true story). Not one of my smarter money saving strategies. Being uncomfortable outdoors is largely a function of being incorrectly dressed. Luckily for you, most of this gear makes an appearance in thrift stores, on Craigslist, and at garage sales. Mid-winter and early spring are excellent times to find cold weather clothes on clearance. Here’s another frugal tip: instead of looking for outdoor “sports” clothing (such as ski gear), look for gear worn by people who work in the cold (or in refrigerated warehouses). This line of clothing is designed for people who know what works, and who are looking for stuff that’s warm, useful, and a good value. It removes fashion from the equation and replaces it with thrift, economy, and function (ski gear, conversely, is largely about fashion, followed by function). While there are myriad winter sports to choose from, as a frugality maven, I feel its my duty to point out that not all sports are created financially equal. There’s nothing wrong with pursuing a more expensive sport if that’s your THING, but if you’re casually easing into wintertime outdoorsy-ness, consider that you might be able to reap the same benefits (fresh air and exercise!) from a cheaper option. Hiking: this involves walking around outside. Snowshoeing: similar to hiking, snowshoeing is incredibly simple–you strap snowshoes (here’s the kind we have) on your boots and you’re off. Do not laugh but, when we first moved to Vermont, we’d never snowshoed before and so we googled “how to snowshoe” and proceeded to watch several informational videos on YouTube. I will save you the hassle and the suspense: all you do is walk, there’s no technique involved. Just don’t step on your own snowshoes and you’ll be fine. Sledding: get in a sled and aim yourself down a hill. Not a whole lot of gear, skill, or special terrain (such as a mountain) is required to participate in these “sports,” which why we love them. P.S. When we lived in the city, Mr. FW biked to work year-round. Check out his tips for successful winter biking. As you might’ve noticed, we have a one-year-old in our ranks. But this hasn’t deterred us from near-daily outdoor sporting. Fresh air is good for everyone–babies included. 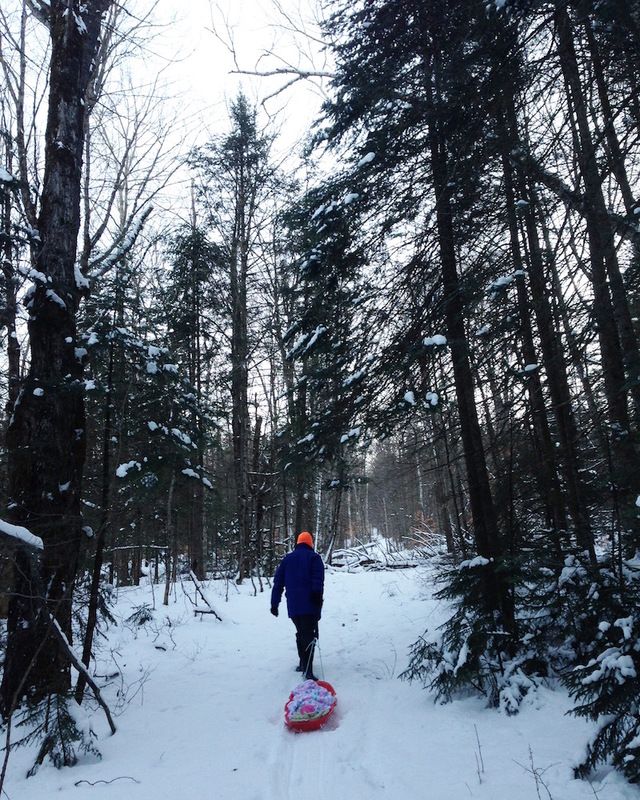 We started snowshoeing with Babywoods when she was two months old and she’s been out almost every day since then. There’s nothing inherently dangerous about taking a baby out in the cold–they’re just tiny humans after all and, if properly bundled, they’ll enjoy the break from their indoor environs. Going outside instantly transforms Babywoods’ mood (for the better)–if she’s fussy or upset, as soon as we go out, she relaxes and looks around at the world with interest. In my experience, taking a walk is an instant baby-mood-improver. If you’re wondering how to get started trekking with an infant, you’ve come to the right place! 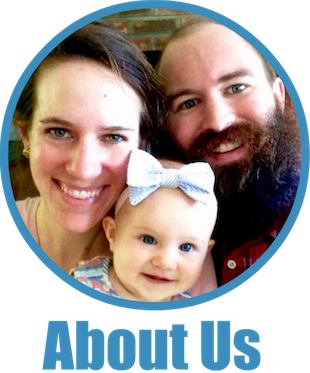 Until Babywoods was about 10 months old, I carried her snuggled up against my chest in a hand-me-down Ergo carrier. I like the Ergo because it’s designed like a hiking backpack (and thus has ample back support) and it’s not too bulky. Slings or wraps also work for tiny babies. Until a baby can hold their head up on their own, they shouldn’t be put in backpack carriers. The other advantages of a front carrier are: 1) If you’re nursing, you can nurse your baby without removing them from the carrier (very handy when you’re on long hikes through the woods), 2) You can zip your coat around the carrier for added warmth. 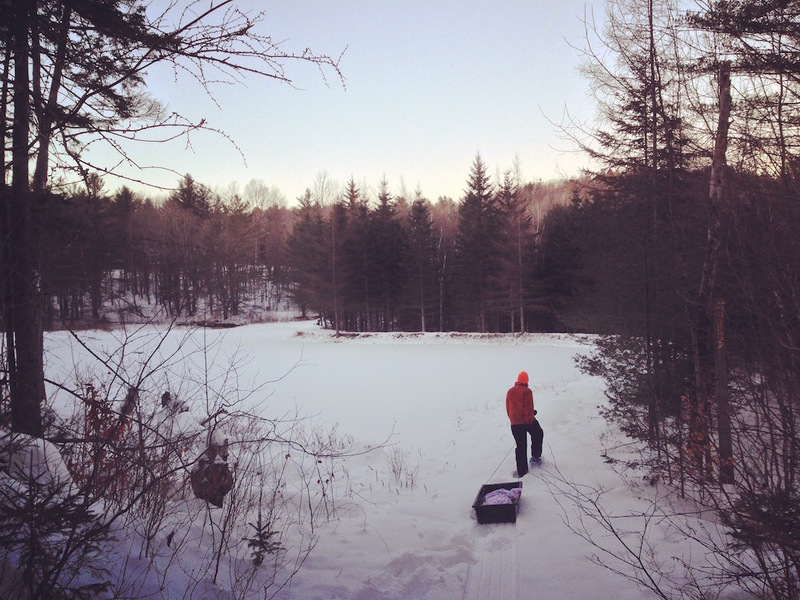 Mr. FW testing out the small plastic sled in our woods. Verdict: not sturdy enough. Now that Babywoods is an emerging toddler, some folks love hiking backpacks for this age. We, however, were in search of a ground-based solution in order to decrease back pain–even the best carriers are still a weight on your back and shoulders. And so, we discovered the game sled! You might recall I was lusting after ridiculously awesome and expensive (even on Craigslist!!) strollers that convert from wheels to skis. While I’m still hoping one might come my way for free or cheap, I’m not holding my breath. They’re so popular up here that I couldn’t get anyone selling them on Craigslist to even return my emails! And so, I took advice from the people who know best: the readers of Frugalwoods. 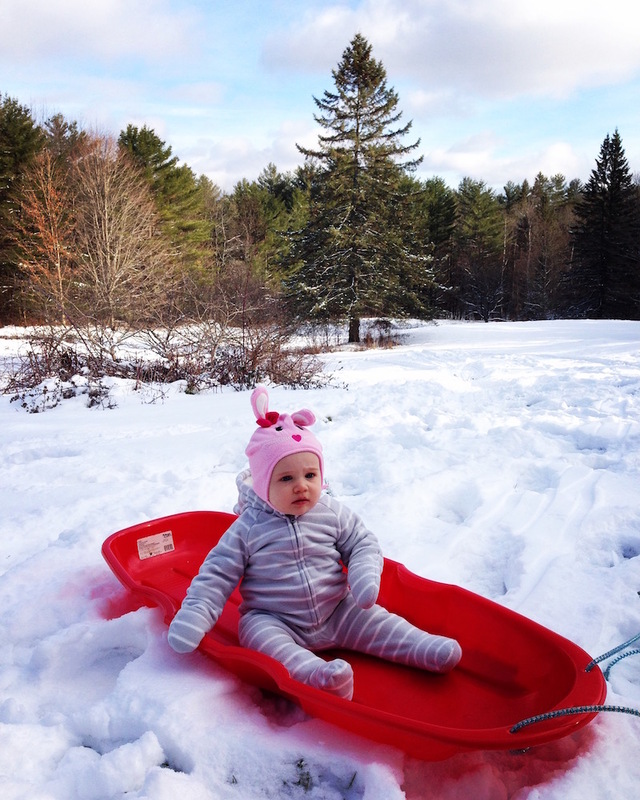 Quite a few of you suggested we use a sled to convey Babywoods and we tried a regular old plastic kiddy sled, but the problem is that our snow is so deep–and our terrain so uneven–that this little sled took on snow and tipped over. But, fellow Vermont mom Tara and Alaskan mom Maureen knew the answer: they use a game sled to tow their kiddos. What’s a game sled, you might ask? It’s designed for hunters to pull their game out of the woods. Hence, the tow rope is long, the plastic is super durable, the sides are high enough that no snow comes in, it’s stable enough that it doesn’t tip, and being made entirely of plastic, it’s lightweight. 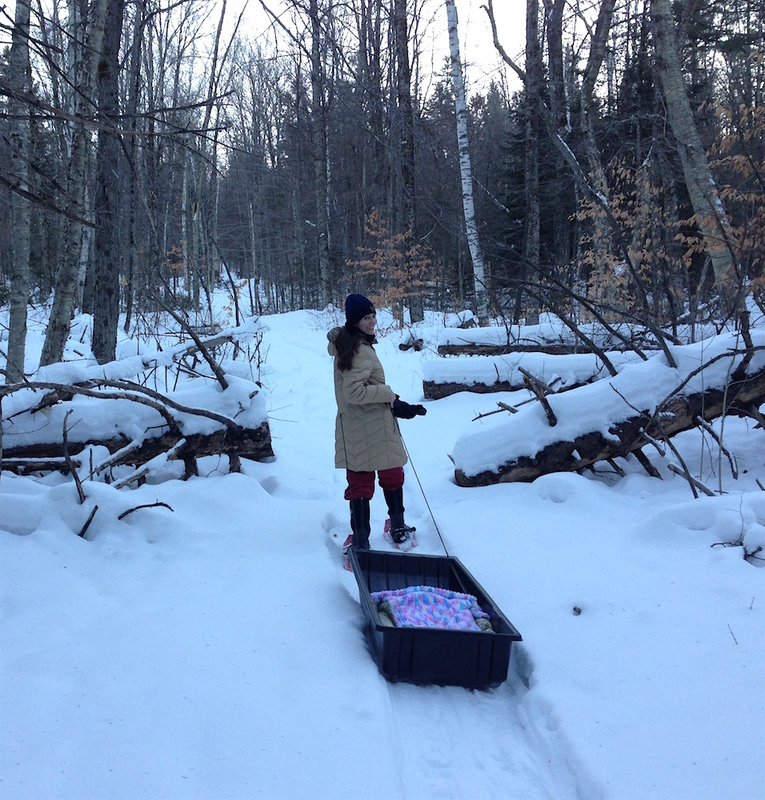 Me towing Babywoods in the game sled up our woodland trail. Verdict: success! And so, we bought this one! I put a bunch of blankets in there, cozy Babywoods on down, and she loves it. The best part is that, at $50, it was a fraction of the price of traditional children’s towing sleds and massively cheaper than my ski stroller fantasy. Hey, I have no problem using a dead deer sled for my child. We’re still trying to work out the best way to pull the sled when going downhill. On a slick surface, such as our driveway after Mr. FW plows it, you can drive it in front of you like a sleigh–easy! But on a snow-packed surface–such as the trails through our woods–it won’t slide in front of you on a downhill, so you have to pull it behind you, but then it hits you in the legs. Boo. Our plan is to buy poles and affix them to a belt so that the sled will stay equidistant from your body whether you’re going uphill or down. A work in progress, but a worthy goal! I can also confirm that this sled is enormous and would fit at least four children and a dog. So far, I’ve tested it with two babies and there was plenty of room leftover. The back comes up quite high, so an older child could sit with their back against it. I imagine that’s what we’ll transition Babywoods to when she no longer wants to lay flat (she likes to nap in there, so I think she prefers laying down at this point). If you’re in a place with sidewalks and city streets, I find a stroller works incredibly well. Baby can see what’s happening, but still be bundled in and cozy. Babywoods loves strollering around when we go into town and, our stroller also works on woodland trails when there’s no snow. As a native of southern California and a small person who despises froze toes (and anything else), I eventually realized that, aside from wrongful clothing, it was my own mindset that was holding me back from full participation in outdoor winter life. I feared the cold! What would happen to me out there??? Turns out, nothing bad. There’s a great rush of adrenaline from exerting yourself in the cold and it’s an invigorating part of my day. I always, without fail, feel better after taking a hike (cold weather or not). We are often the only thing standing in our own way of trying something new. Breaking down the barriers we have in our own minds for why we can’t do something is liberating and a powerful reinforcement of our inner strength. Plus, getting comfortable with year-round outdoor exercise is an excellent way to eliminate the cost of a gym membership. And if you’re participating in my Uber Frugal Month Challenge (which starts January 1st… you can still sign up here! 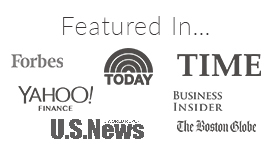 ), then you’re looking to trim out every one of those unneeded expenses in your life. So do yourself a favor, suit up and get out there! What are your favorite outdoor winter activities? Please tell us what mittens you have! I have conquered almost every other part of being cold outdoors but my hands…oh my hands! And trying to hold my dog’s leash while wearing mittens is complicated so I stick with fingered gloves but I really think mittens is where I need to go! I use REI brand merino wool glove liners (there’s usually a coupon around) and split fingered mittens – basically glove and mitten combo. Easy to hold the leash but then I have a liner for when I need to take my hand out (like picking up poo!) for greater dexterity. I’ve bought some nice mittens at the Burton Snowboard outlet. Water resistant and usually very affordable. I also find REI, EMS, and other outdoor retailers have very good sales. Hunting stores like Bass Pro and Cabelas have cheap options but they are usually very cheap materials and don’t keep the heat in. I also wear glove liners. Agreed! Mine are from REI many, many years ago. We still use the ergo for hiking with our almost 2 year old. Your gear brings a chuckle. We had some friends from the south visit and they had to acquire gear. We’ve lived at the snow line our entire life so we’re no stranger to what to buy. However before getting here they attempted to buy gear from capella’s on their own. It was definitely interesting redirecting them to what actually worked from the over priced southern hunting gear they bought. It didn’t help that it was in the teens why they were here. I love this. When I was younger, I’d snowmobile with my dad. I always thought I hated the cold, but really, I just hated being unprepared. The gear was an investment (thanks, Dad! ), but I still wear the same snow pants and jacket today when I take my goddaughter sledding. And when we get really deep snow, I love those boots, clunky as they may be. It dropped well past zero here much earlier than I can ever remember, so I haven’t gotten outside quite as much as I would like. But even a loop around the neighborhood to take in the lights makes a huge difference in my winter spirits. And can I just say how glad I am that you did this post?! I love all the outdoors with Babywoods Instagram photos. It was so fun to get the details behind them! We live in western NY and definitely see our share of snow and cold too! You are so right about having the right gear. It’s amazing how long you can enjoy the outdoors when you get a good pair of boots and the right gloves (my two areas that always get cold first!) 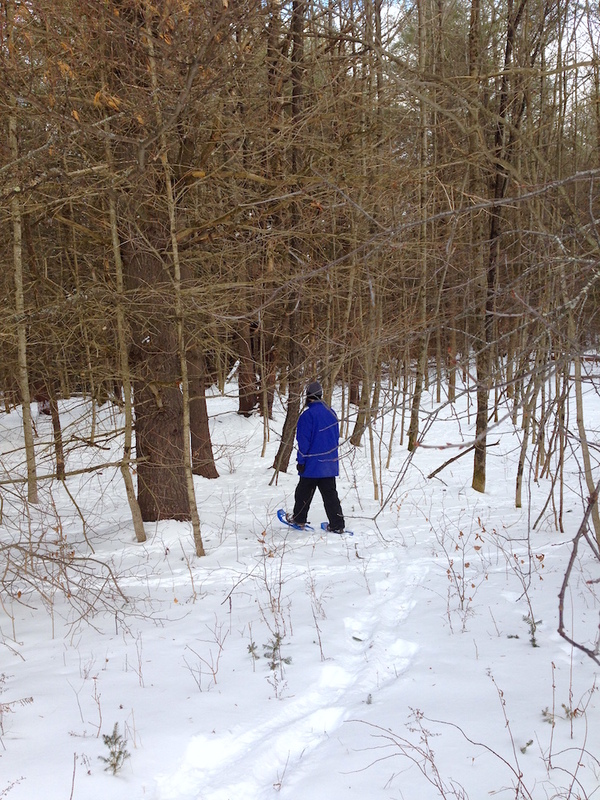 We enjoy winter hikes to the lake and cross-country skiing a few times a year at a local nature center. Love your suggestion about checking Craigslist for used cold weather gear too. Lots of people buy great items for outdoor use and rarely (if ever) use them! I have had one of the Lands’ End down coats for more than 10 years now, and it’s still going strong. It’s almost like a security blanket. If I wear anything else, I’m scared I’m going to be cold. Hehe, love the dead deer sleigh 🙂 The stuff that works the best isn’t always the most fashionable. We have been flexing our cold muscles a lot more this year. Most days we don’t even fire up the wood stove until lunch. Instead I get out in the cold and jog to the gym. As you said it’s exciting to challenge yourself, and once you get moving it’s not bad. Love the sled idea! Our old sled just bit the dust during a recent snowstorm, and we’re on the lookout for a new one. My little guy (1 and a half) loves to be outside all bundled up. I’ve found consignment winter coats/snowpants/snowshoes work very well for little ones. They usually outgrow the gear before they wear it out because they grow so much between seasons you can’t reuse it in future years until they’re older. My older boys (13 and 9) can get two seasons out of gear if we buy it slightly large in Year 1. Usually we limit our outdoor activities to hiking and playing in the snow outside. I’ve been wanting to take my kids skiing over the years, but it’s just so expensive here. I continue walking and biking in the winter, much to the dismay ad disbelief of others. Humans have thrived near the northern Arctic circle for millennia with fewer modern amenities and technologies because they were/are properly clothed and prepared. I prefer the cold because it energizes me to keep moving to stay warm. I can also have Shenandoah National Park an other outdoor wonders practically to myself. What’s not to like about cold weather? Yay! As a fellow winter aficionado, I love this post! I grew up off the coast of Lake Michigan and decided to move to Alaska when I was 18, because Michigan wasn’t cold enough apparently. I’ve done dogsledding (warning: not budget-friendly), hunting, skiing, snowboarding, snowshoeing, and ice fishing. Alas; I live in CO now and I’m afraid it might be a bit too warm this winter to go ice fishing. One thing that’s important to point out is layering with a couple different thicknesses of sweaters, especially if you’ll be out exerting yourself in the extreme cold. The amount of layers you need to keep yourself warm while exerting yourself is very different from the amount of layers you need to keep warm when you’re sitting still, or if you haven’t warmed up yet. I even like to layer with gloves sometimes – buy some cheap glove liners for when you need finger usage, then stuff them back into mittens to keep uber-warm. I also like bringing along a backpack to store the shed layers in. Long underwear and facemasks are a must in Northern winters! Along with snow pants. Honestly, we’re not big fans of winter, but with the right gear, we manage to enjoy it quite well with winter hikes, sledding, ice skating and ice fishing. We have the same sled and use it all year long for haulin everything, and for sledding in the winter. It is over 5 years old and in perfect condition! Oh yay! So glad to hear it has lasted! I look at your Instagram pictures most every day and am in awe of your enjoyment of all that snow. We live in Arizona at about 5700 feet and got about a foot of snow over the weekend and were not pleased. :). But we moved from Colorado hoping to seldom see snow here. In any case, I have a question about hiking shoes. I have yet to find shoes that I don’t have to replace an annual basis, due to wearing the tread down, and this with Merrill’s and Keene’s, and I actually do this with two pair – hiking sandals in the summer and hiking shoes in the cooler weather. This week bought my first pair of North Face hiking shoes. I found them at the outlet store for $30 and was PUMPED to find them at that price. I wouldn’t even say I an the most avid hiker, and yet I consistently wear the soles down to the point that I am sliding on inclines and have to replace them. Has anyone who hikes a lot found shoes that don’t do this? Where we live there is a lot of sand/rock and we are in the mountains, so are almost always walking on inclines and good tread is a must. Hmm, that’s a good question! I’ve had the same pair of Merrill hiking shoes for about 8 years now and they haven’t worn down. I only wear them for hiking, but I’ve put quite a few miles on them. Same goes for our winter boots–they seem pretty long-lasting. Maybe some other folks with similar experience can share their tips with you! Similar question — do the muck boots in your link have heavy tread that helps with traction on steep or slippery trails? Yes they do! The tread is HUGE on those boots and they work really well. I also am able to easily put my snowshoes on over them, so they’re ideal for me. If you’re wearing your shoes down that quickly, it may be worth seeing a podiatrist, orthotist or biokineticist (or whichever movement specialist is available in your area), and having your gait analysed. Paying for orthotics and getting more wear out of quality shoes may be the frugal option for you. Good luck! They wear down really evenly on the heal and ball of my foot and both feet look the same. I actually have orthotics but only wear them in my crossfit shoes because otherwise plantar fasciitis flares up. I should say I probably walk 45-60 minutes a day in addition to longer hikes on the weekend, and the daily shorter walk/hikes are a lot of pavement walking from my house to the forest, but I don’t wear my hiking shoes just around the house. Maybe I walk more than I think? I guess I could put my orthotics in my hiking shoes and try that, especially since I got new shoes. I have two pair of orthotics because I temporarily lost a pair in a move and finally got the second set and then months later found the original ones. My boots wore down consistently in CA and AR. I think it is because so much of the hiking is done on granite or rocky terrain. On the East Coast, your walking on dirt and leaves. My dog has to wear shoes in CA or her pads get ripped up. It was not an issue in OH or New England. You should consider going to REI or LLBEAN if possible for hiking boots. They would most certainly help you find the perfect fit and replace them if they wear out that quickly. I had a winter coat for about 7 years from LLBEAN and the zipper malfunctioned and they gave me a new one no questions asked. They also replaced my hiking sandles when the sole came loose. Just some food for thought. Bbrrr! I really don’t do well in the cold–I break out in itchy, painful hives! You are so right about the right gear, though! Next year, finally, our new home will be built on our heavily wooded property. It will be a half mile walk to the mailbox, so I’ve acquired the requisite gear except the face mask, to be prepared to get the mail. I’m actually looking forward to this reason to go outside everyday! Thank you so much for the links, I’ll be getting a face mask and be ready for anything. It’s so true about the facemask–I find I can endure very, very cold temps and high winds with that thing on. It is magical!!! Thank you for this post. I am also a former Southern Californian who just moved to Missouri a few months ago and this is my first real winter. I am finally getting the hang of when to wear what jacket (my warmest is a hand me down from my granddaughter) after a few incidents of being too hot or feeling frozen, but still have a few issues. It’s warmer here than where you are but we recently had a week of ice and snow with windchill around 20 below. My biggest concern is slipping and falling. I already did it once and my arm is still recovering. Sometimes it feels like I am living in an ice rink. I would love to continue my daily walks in all weather, but find I am holding back from enjoying the outdoors when it is icy. In MO, at least so far, we don’t get a lot of snow or ice depth so some products might be overkill. I appreciate your sharing what you wear and am inspired by your snowy adventures to get outside again, no matter what the weather is like. Thank you. I find that snowshoes are ideal on ice. They have metal teeth on the bottom, which dig into the ice quite well. Good luck and I hope your arm heals soon! You might look into Yaktax also. They are about $20 and slip on over your shoes and help give you more traction. We get them from Amazon, but in bigger towns you might have a store that has them. Brrrr!! It looks mighty cold up there! I’m in Texas and it’s currently 70 degrees. Oh, winter. This is a good point, though! Even though we’re all about saving money, there are times when you do need to spend money on quality items. And that definitely includes cold-weather clothes. I bought a reversible REI jacket on sale a few years ago. It did cost $80 but I won’t need to buy another for at least 10 -15 years or more. Not bad! Our dog pulled our kids in a wooden sled with a back, we attached a ‘harness’ we made out of pvc pipe. It worked great but I don’t know if Frugalhound is the right breed for this. I can email you a picture if you want to see the rig. I live in Montana by the way and understand long cold winters. Vitamin D deficiency in the Northern Tier is a thing y’all. 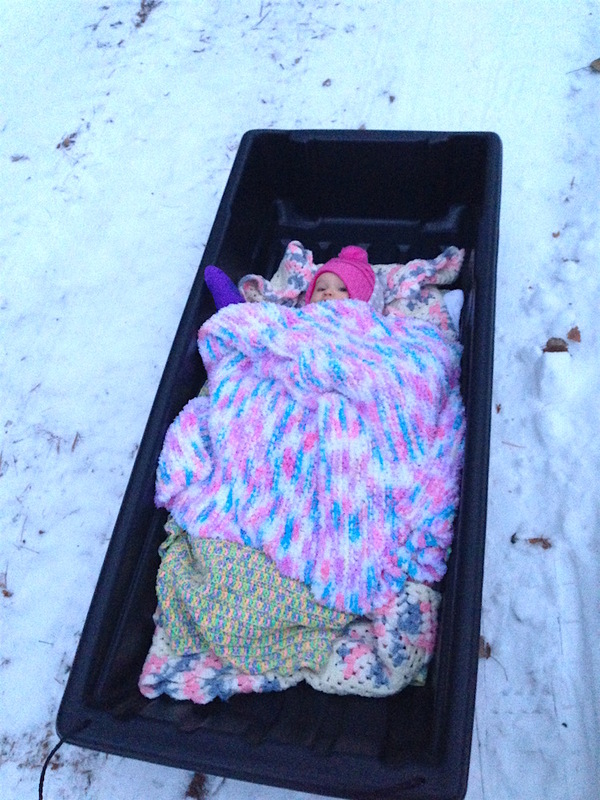 We did this in Salt Lake when our daughter was little, just not with a cool game sled! 🙂 PVC works great, strong and cheap. 2 long pieces, 2 90 elbows and a short (cross) piece that goes through two holes drilled in the front of the sled. We were low tech and just tied the PVC to a belt that we wore to pull the sled. For the dogs (two chocolate labs) , we had chest harnesses and a “splitter” leash attached to rope that ran back to the front of the sled, again using the two holes. The dogs and our little one had a blast, they really enjoyed it! Jee what A great winter landscape, here in the netherlands it had been 6 years ago since weve seen snow and ice. How do you recreate outside when it rains for a week straight? We just get wet when we go out :). That’s why all of our gear is waterproof–it really helps keep your core dry. And we hold an umbrella over Babywoods if it’s really coming down–looks funny, but totally works! I live in Butte, MT traditionally one of the coldest places in the lower 48. I buy most of our winter gear at a ranch supply store. It’s warm and durable. One of our favorite outdoor activities is cross country skiing. We have 3 nearby locations and bought used rental skis. I have never tried snow shoeing but it’s next on my list! If you ever have a whole group of people together on snowshoes, and access to a ball that you can kick around, snowshoe kickball is a hilarious way to kill some time. As long as the snow is deep enough to cushion all the inevitable pratfalls, of course. Oh man, being terrible at sports, I think I’d injure myself ;)! But that does sound like a lot of fun! We participate in the most expense winter hobby – downhill skiing – but I want to get into snowshoeing. We don’t get enough snow in MA for snowshoeing or cross country on a regular basis but all the driving to NH/VT is making us wish we lived up there! We do try to do it frugally by buying passes, carpooling and bringing lunch but it’s still a luxury. I’ve found the best deals at LL Bean for coats, base layers, etc, and I love the warranty. I also had to invest in a new coat this year as my prior ones were too small but the Burton outlet has some great deals. It was cheaper than LL Bean or another retailer. We also try to find used gear when possible but Craigslist can be very overpriced for certain items (downhill skis from 1999). My husband did get a full set of cross country ski gear for himself for $20 (he has a large shoe size so not much competition). I also find offseason is much cheaper so I try to get my ski gear during the summer! Ahh yes a timely post as we just spent the holiday in the Midwest winter weather. Growing up there we definitely had our fair share of winter apparel. Being gone now for 5+ years I think we’ve grown soft. We also got rid of a bunch of bulkier coats, however had to pick one up for our little guy. It’s tough when they’re young and growing like a weed. We always look for deals especially since we know he won’t wear it many times. Enjoy the snow hikes! Great Post! Being active in the winter is a necessity if you live in a cold climate. It helps fight off the seasonal depression and is most assuredly a badass proposition. Layers, no cotton, stay dry, and wind and water protection is the recipe for success. Also, no cotton. Ever. Jeans (denim) are cotton. No cotton. Okay!? My notes on gear (and I think someone else may have commented similarly) is that there is a difference between standing still in the cold and moving. If you are moving, hiking, running, ice skating, shredding pow, cutting firewood, drinking beer, then you really don’t need much. Protection from wind and water (including your own sweat) will go a long way to keeping you warm and happy. If you are standing still, why? Get moving. 🙂 If you’re moving, I’m a big fan of using a shell jacket and pants (no insulation) that are wind and waterproof (waterproof being a gore-tex like fabric, not a rubber jacket). I’ve been using the same jacket for about 15 years! Also, use a jacket with a cinchable hood and cinch it right down over your head. Viola, windproof hat! Also, a good cinchable hood will not obstruct your peripheral vision. Then, just adjust the insulation needed based on temps and if you are moving. For example, If it’s about 20 degrees (f), are you are moving a base layers with a light sweater works great. Then when you stop, throw on a fleece or puffy down jacket (I like the REI Co-op one) or larger sweater and, Bam! you’re good to go (or stay as the case may be). Oops, sorry, this comment got too long too quickly! My husband and I just recently updated some of our outdoor gear…I did not know about these awesomely intense face masks, though! Will be looking into them. I have a love/hate with New England winters, having lived here most of my life…but going outside to frolic or hike in the White (or Green) Mountains is different than shoveling off the car before work and probably because you’re dressed better. I have this Burton jacket I got when I was 16/17 and at 25 I still own it. I’m thankful I went with a simple Black jacket and not the plaid patterns that were super big in my teens :p It’s lined, contemporary, and still works fine. Why get rid of it? I did, however, just buy a long Eddie B. down jacket because sometimes the buns get cold on a short jacket 😉 I got it at Second Time Around- a designer thrift store- for $45! And it was originally $90 @ STA, so double the discount. It sounds like you’re good on winter clothes for many, many years, but if you ever make it into Burlington, you should check out the OGE (outdoor gear exchange) if you haven’t. Their consignment really blew up the last few years with tons of jackets, boots, and other clothing apparel. When my daughter was 5 months old, we put her in a cooler (you know, the kind you pack beer in for the beach) and cushioned her with blankets. Then we dragged her around the neighborhood after a snowstorm since she was too little for a sled. She loved it!! I wish I could post a photo here! I have the exact same hat. It is warm. Thanks for posting the mask, that’s a small price to pay to be outside during the coldest times. As the saying goes: no bad weather, only bad equipment! Enjoy the winter. Summer and increased chores will come soon enough. 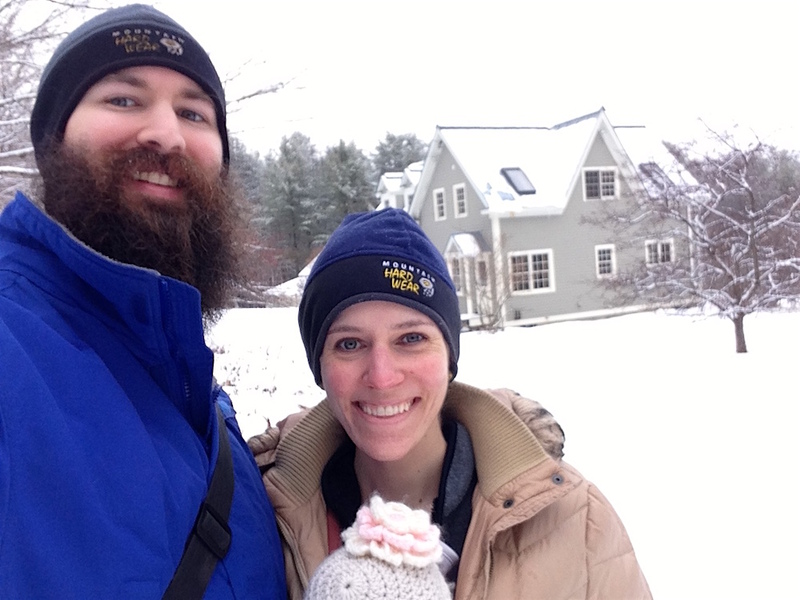 Growing up in Maine – I’m no stranger to the cold and long winters. 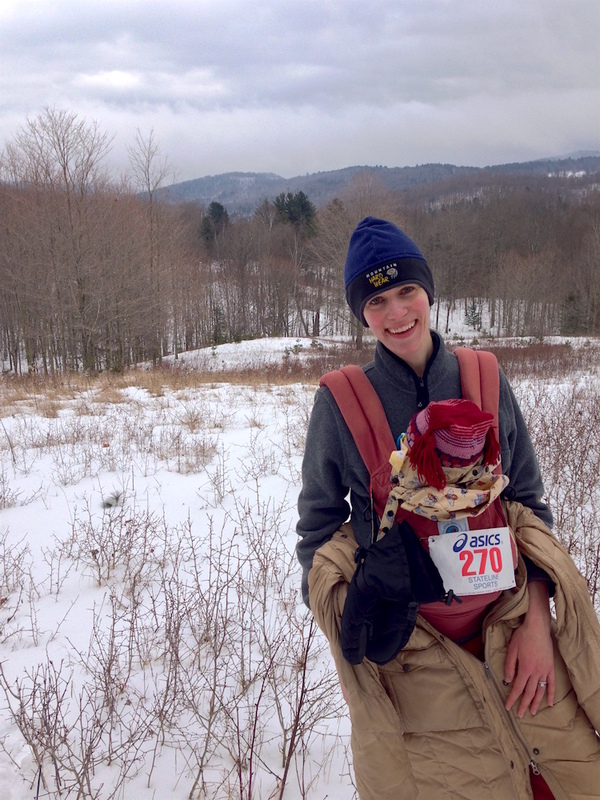 Great post about embracing it all and learning how to have fun while still staying warm. Even as I approach 40 – I can’t think of too many activities that are more fun than sliding down an icy hill with a bunch of friends! Do you get lots of wind? Cold is one thing; wind is another; together, they will keep me longing to be inside. I feel the same exact way about running in the winter this year! It’s my first time doing it -sometimes I bring the kiddos and sometimes I go solo- but I can tell my mood is so much improved from the fresh air and the physical work and the deep breathing. I could go on and on – I feel like winter running has helped me so much! 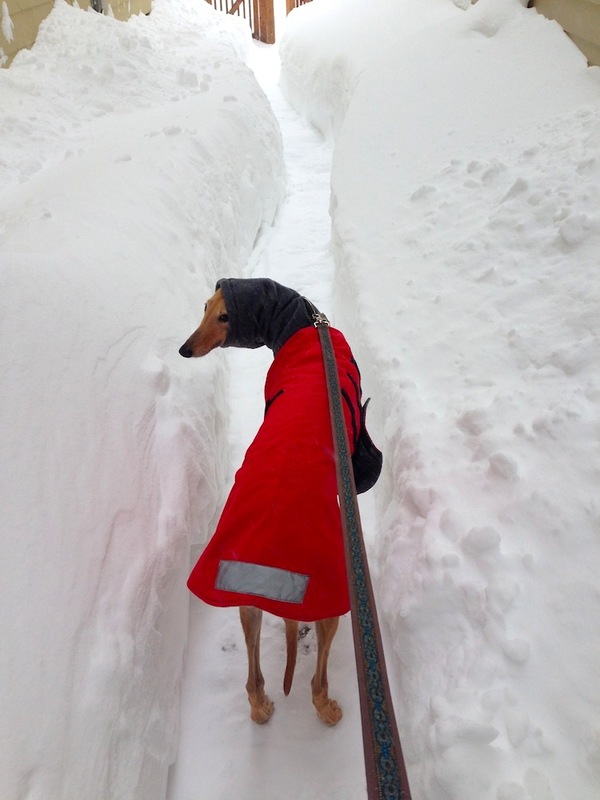 Granted we don’t have the snow here in the Midwest that you have up in Vermont – not yet anyway! I may have to sled instead once it gets colder here! I’ve always hated winter. I’m just not a cold weather person! I think some of it has to do with not being able to properly bundle up, but even as a kid I was always the first one back indoors. Might need to look into warmer clothing :). I used to sky when I lived in the Northeast, but haven’t in quite sometime. It’s pretty flat here in the Midwest. I like taking walks in the snow. I also have to get outside to shovel the sidewalk and driveway when it snows. My hat, gloves, boots, and down jacket make that a not-so-bad task. We found with little guys, an old plastic milk crate works pretty great as a seat to keep them upright. Seems like my husband cinched ours down with a tow strap or bungy cord. Have fun out there! My boys are an awkward age–too small to walk far, too big to pull or carry. Also, as a single parent, I fear getting lost. I look forward to snowshoeing with them when they are old enough to help navigate! Your story about the game sled made my LOL. Also my mom, whom I’m visiting. I couldn’t agree more. One challenge I have with cold weather gear is finding stuff that’s wind-proof. It’s a harder challenge than you think. Most winter gear is made to look warm, but rarely is it wind proof. Even though we live in FL now, I still own my LLBean Baxter State Parka. That was one of the first things I bought myself when I got my real job after college. Best jacket ever! It sounds like you are making the most of winter, even enjoying it! What kind of gear does Frugalhound wear? She has a thick winter coat from K9 Voyagers, which works well! I love using items “meant for something else” as a means of greatly decreasing the cost of purchases. This can be used for so many different purchases, especially wedding stuff which tends to be priced at 2-3x the price for the same things just because they are labeled “wedding”. For winter clothes there have been many times that I’ve desired to purchase new things only to find what I already had (albeit slightly unfashionable) could easily still be utilised in the winter and spending hundreds of dollars on new fancy gear was unnecessary. I love skiing, cross country skiing can usually be done for cheap and I do have the dreams to move to a skii town, allowing me to buy a years pass which would greatly minimise the cost of skiing almost daily. We live in Maine and all 5 of us love the outdoors. Our boys 10, 4 and 1.5 love sledding. Our biggest problem is getting the 1.5 yr old to keep mittens on. We also use a dead deer sled, which my husband uses for hunting to pull kids when hiking in the woods and it works great for sledding. The oldest two love cross country skiing, age 4 is wearing skis that were mine, that used to go over boots. We found a regular pair of ski boots for them and a used pair of adult skis for $8, we took the bindings off the used skis and put them on those skis, viola, a better ski package on the cheep. My husband found a pair of skis with the same binding that fits his boots at the dump recently, yeah, new skis! We find that if we accept any used gear from friends we can outfit the boys pretty frugaly. And we have three children who will wear them eventually, so purchasing a nice pair of used boots for twenty dollars for the oldest equates to about $7 a boy during the boots lifetime. Not bad for a sport we all enjoy! We also wear muck boots. I have a pair going on 8 years, still keeping my feet warm! Usually we can find used boggs or mucks for the kids and again $20 over 3 kids, not bad! I did splurge on new mittens for the kids this year, they have a long cuff that goes up to the Elbow and keeps all the snow out, the big boys love them, the little guy still thinks it is torture! Worth it as the 4 year old will stay out a long time with toasty hands! I find you have to embrace the snow and cold , sledding, hiking, snow shoes, skiis, Fort and snowman making, can all be done out the back door for free and everyone has fun! NJ doesn’t get much snow but I still love running outside during the winter! Nothing like fresh air to clear the brain. On really cold winter days, I use a Buff to cover my face and if there’s snow on the ground, YakTrax over my running shoes. Well, living here in North Florida, one would think I don’t keep more than a cardigan sweater on hand. One would be wrong. Let me tell you all about the Christmas Eve it was 14 degrees, the year it snowed on Christmas day, or the year my husband had to make an emergency trip down to his workplace in the woods to take care of the water pumps because it was 7 (seven!) degrees in that low-lying swampy area. Okay, I won’t really tell you all about them, but I have to say that we have long underwear, glove and sock liners for our gloves and heavy socks, and nice heavy winter coats. We both also have warm hats. Granted, it’s usually not all that cold and sometimes it’s almost hot, but we have enough cold weather to merit some warm clothes. Our favorite winter activities? Yard work and household repairs! I’d much rather dig dirt, lay pavers, build raised beds, build a shed, or paint in 45 degrees in the winter than in the summer at 93 degrees with 95% humidity! Regarding poles, I’m amazed it did not come with them. One idea is to find a trashed lawn mower or spreader, and reuse the poles & handle for more control on slopes. Winter clothing when hiking, snowshoeing, or x-country skiing needs ventilation for sweat. When you are working, you will get warmer, when standing still, colder. So wear layers you can unzip & rezip (or button/snap….). You want to avoid sweat as it will chill you when you stand still. Your before sounds a lot like my boyfriend and my relationship. He constantly wants to go for a walk, go to the park, etc. and my response is often “It’s cold.” Drives him nuts. You encouraged me to go out and buy a new winter jacket, which is something I have been putting off for a while. I lost the liner for my 3-in-1 jacket, so now it’s just a windbreaker, so I have been particularly anti-outdoors lately. Our locally owned gear store(Midwest Mountaineering) has a “thrifty outfitter” section where they sell all of the slight defects/returns/closeout/samples. I’m very lucky that I can fit into sample sizes(usually S only) so I went today and got a sample Mammut coat for a pretty significant discount. Yay! There are really better sports in snow. We always look forward to skiing during winter, and it’s a best bonding activity in our family. A delight to read this post Mrs FW. And looking at all that snow has helped me cool down as we are in the middle of a heatwave in Brisbane, Australia at the moment. Still 30c degrees even at night. One vital bit of winter outdoor gear for me is those disposable chemical toe-warmer packets that stick to your socks inside your boots. I know – disposable, chemical, ick! – but I suffer poor circulation in my extremities, and if I don’t use those things I can’t be out on my snowshoes for even ten minutes. They’re not expensive and they make the winter sports possible for me! We really enjoy cross country skiing and found a great bargain on skis in a summer sale. Alas, despite some days of bitter cold (-40 wind chills) our unseasonably warm weather (today was 40!) Means it is unlikely we will get enough snowpack to ski at all this year, and with the same problem last year we got only 1 day in 🙁 the snow just doesn’t stick around like it used to. Stupid global warming. Best sled ever! It also makes the perfect storage tub in summertime. We have a small attic space above our garage so we load all our winter gear like snowshoes, other sleds, etc into the big sled and slide it up into the attic for the summer months. Everything in one place! Sounds like a lot of fun, but I’m happy to avoid the cold all together here in California. Obtaining the correct, high quality equipment is a good idea for most activities, cold or not. Frugal Hound must have taken the family picture. 🙂 Those greyhounds have so many talents. Like you, I hate cold! I suffered through many winters while living in Europe (where I was brown and grew up) and ski trips were always miserable. Only my Swiss/Canadian man taught me about proper gear and helped me buy it and now I go skiing with no issues and even slept in an Ice Hotel (yes, the one made of ice) and loved it!!! He himself has had gear 20 or more years old that’s timeless and works perfectly. If you get something neutral you can have it forever. Great post! Great post! We are very comfortable spending time in the snow. We are avid backcountry skiers so sometimes endeavors are 8 hours long. Sweaty hours. While the ski gear is not cheap (I think my boots cost 2x more than my 1992 Camry), it lasts for years so you don’t have to spend the money every year. Technical clothing is very important for sweaty endeavors in cold weather. As kids I remember getting all decked out in jeans, sweatshirts and tube socks, then coming back from sledding like an wet icicle! I get all of our base layers, mid layers, puffy coats, gloves, glove liners, and hats thrifted, eBay or other second hand sites. Ski socks? Haven’t found too many decent used ones though, but eBay has discounted new ones. For technical soft shell pants and jackets, these are harder to find used, but I always start with eBay first. Then if no luck and I feel like buying new is my last option, I will hunt for the best deal ever. In 4 years I have bought only 3 brand new things from retail and they were all technical items (running shoes, ski boots, soft shell ski pants). Nice outdoor brands often have infinite guarantees. A $100 soft shell Outdoor Research jacket I got on sale 12 years ago had an issue with the zipper after so much use, OR credited me $270 to spend on a very brand new jacket as a replacement! Amazing service and glad I didn’t have to shell out $$ on a brand new jacket. I will suggest you YouTube search “pulk sled.” (Maybe you already have) It will have a few tips on how to modify your deer sled for better pulling! People use these sleds to haul in their gear to remote winter yurts for overnight. Like you, or at lest the former you, I am not a cold weather person. I would much rather it be 110 degrees than 0 degrees outside. My body tends to run cold, so even when it’s not seriously cold outside, I bundle up. It makes a huge difference! My favorite cold weather sport is skiing/snowboarding. I’ve been skiing since I was a kid and started snowboarding in college. We’ve been out to Colorado numerous times for ski trips and would love to make it out to Utah some time to ski. How’s the skiing up in Vermont? I grew up in the great plains of North Dakota with a good amount of snow every year, and the one thing I noticed that was left off for gear is good old fashioned water. Believe it or not, being outside in the snow romping around and you’ll sweat (especially wearing all that snow gear) not to mention there is less humidity so your lungs are working a bit harder (especially in higher altitudes). DON’T EAT SNOW! Just a simple water bottle will do the trick, and feel free to warm it up before heading out and it’ll provide a double bonus. Living in Denver instilled in me the notion that cold weather is no reason to stay inside. With the proper equipment and clothing, my toddler and I are outside year round. When I moved back to my hometown in WV last year I carried this with me. Alas, my toddler is usually the only kid at the park these days but he loves romping around in the woods on hikes and bundles up in the jogger to go on runs with me in 14 degree weather. I’m always so proud that he doesn’t see the cold weather as a limitation to his outdoor play. I love that you guys still get outside with your little one, even in the winter…so many people become indoor couch potatoes once they have a kid and that stinks! I was looking at your sled and wondering if you have figured out any kind of cover for it to keep wind, snow etc. out–thinking ahead to when I will most likely have a kid in a couple of years and would love to be able to make a kid-pulling sled for snowshoeing/XC skiing but would feel better about having the option of a cover like the commercial ones have, seems like that would be warmer. Thoughts? For a split second, I read the title of this post as How to “re-create” in the winter…..and thought you’d taken the blog to a whole new level, lol. As a native of North Dakota-( where snowmobile races and ice fishing are actually popular, and everybody carried blankets in their trunk long before “emergency kits” were a thing) I’ve always known a semi secret potential source of great cold weather clothing is, of all things, the farm stores- Tractor Supply, Rural Kings, Farm and Fleet, etc. The inventory can come and go, and there’s a wide variety in prices, but keeping your eyes peeled can lead to some great finds, like insulated coveralls, flannel lined jeans. And while cotton thermals aren’t the best for active outdoor winter wear, they make toasty winter pajamas, especially when paired with flannel sheets, and are also quite comfy under a pair of sweats for inside wear.